Pince & Pints – New Outlet at Katong! Pince & Pints has always been on my bucket list since the opening of the very first outlet at Duxton Hill, but somehow I managed to keep it on that list while waiting for that special occasion which never came. And so when the press release about their newest, third outlet (already?!) was sent to my mail, I thought, OK, it has to be now. My virgin Pince & Pints experience. This third Pince & Pints is also in a 2-storey shop house but in the food district of the East – Katong. Compared to the first storey, the second storey is way less cramped and is a space that fits all – young couples, a big family reunion, chill nights with your girlfriends. After a whole lot of deliberating on what sides to get, we were recommended the Mixed Platter (SGD32) which came with a bit of everything. Or rather, not just a bit but a good portion of everything i.e. 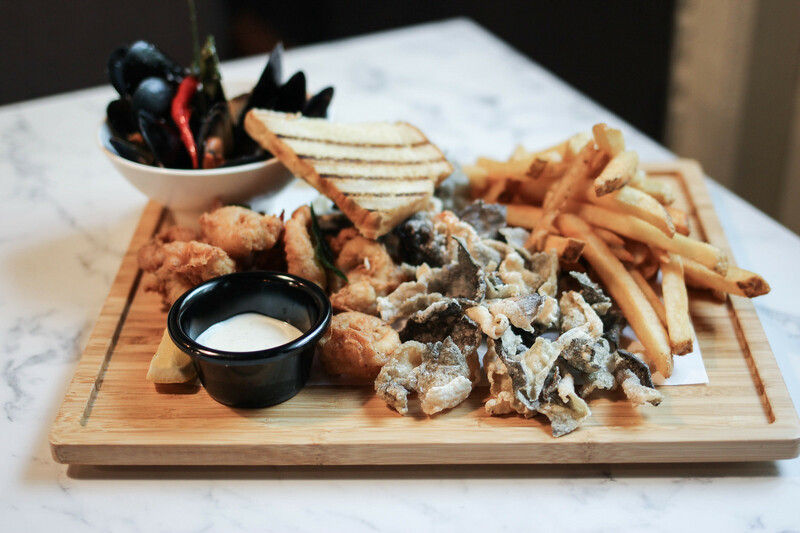 crispy fish skin, fried calamari, garlic butter mussels, straight-cut fries, chargrilled bread and tartar sauce. This will be good for sharing among 3 or more! 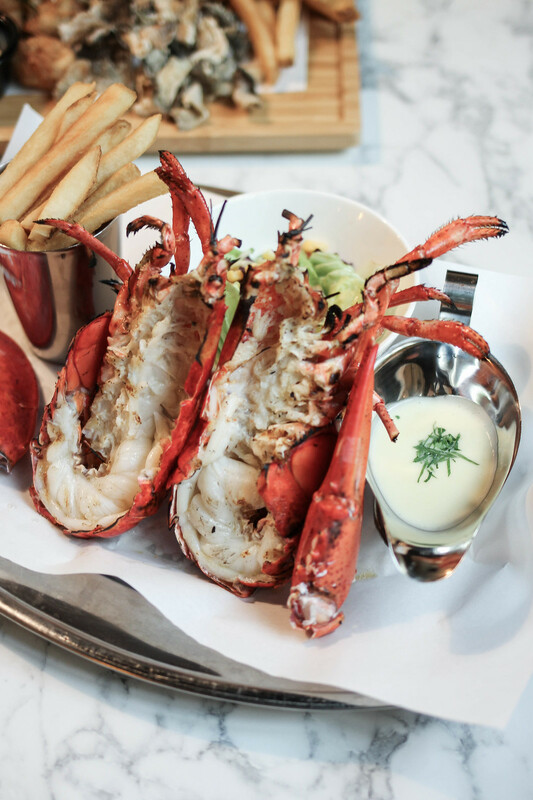 Our main star of the night was the Live Whole Lobster (SGD58), served with Chef’s salad, straight-cut fries and butter sauce, for which you can choose to have it grilled or steamed. 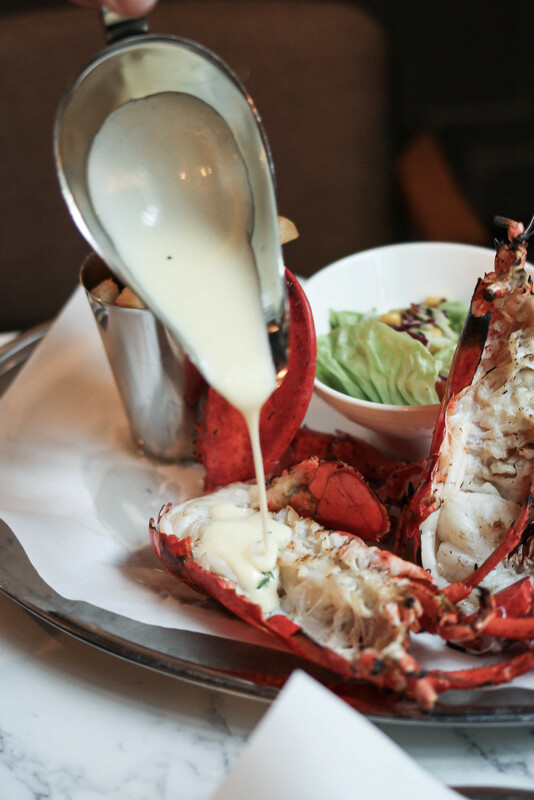 Fun fact: Did you know that the lobsters served here are air-flown every week from the Atlantic Coast and stored in Pince & Pints very own sea tanks? And so the lobster turned out as fresh, plump and juicy just as I expected. 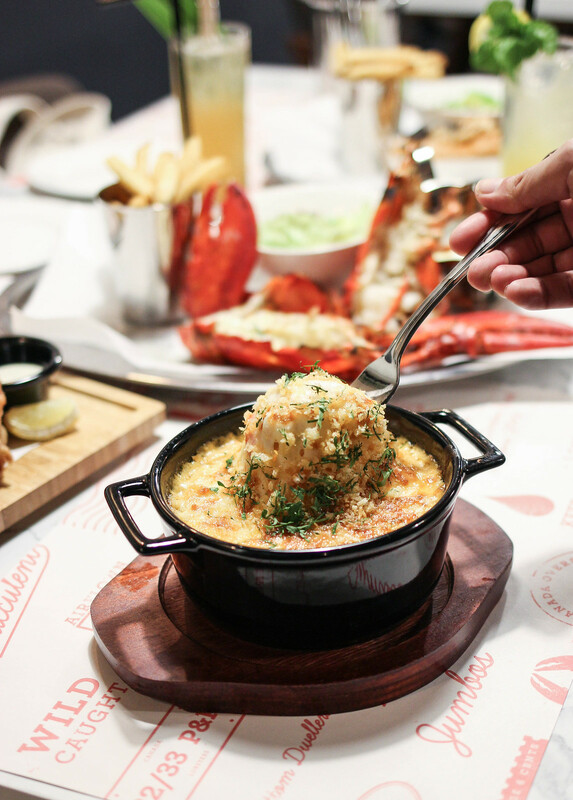 Surprisingly, the butter sauce was light enough to not mask the fresh seafood flavour of the lobster when poured over directly. 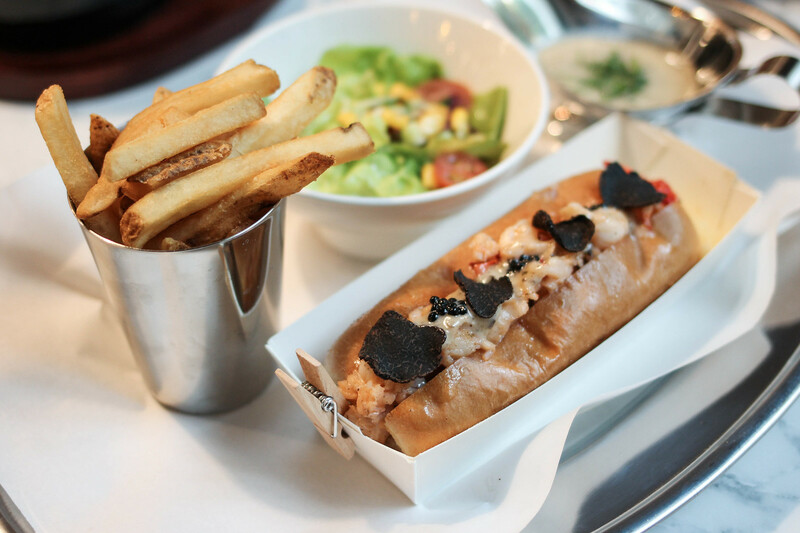 Since we had the Live Whole Lobster, I thought of trying The Truffle Roll (SGD68) instead of the original Lobster Roll. 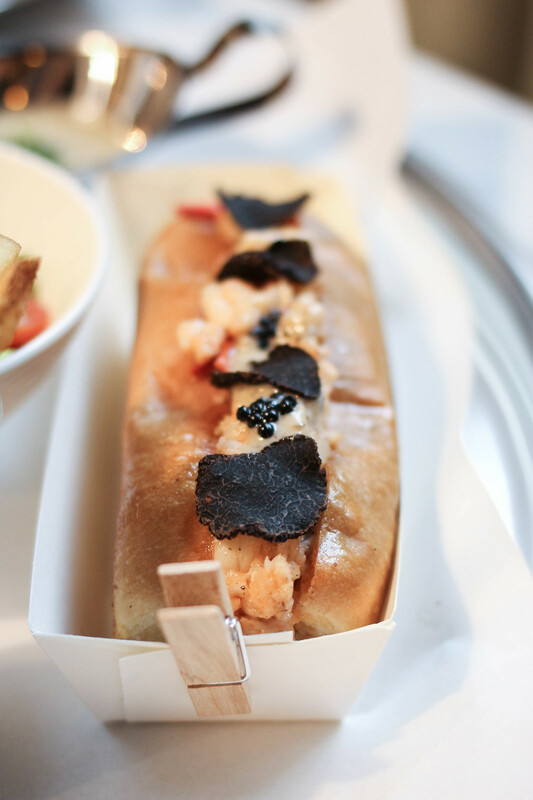 Unlike the original, this lobster roll is topped with additional gems of shaved truffle and truffle caviar, and served with truffle butter sauce. Was that too much truffle for me? Definitely not. Instead of overpowering the entire dish, it was more like a harmonious accompaniment to the lobster roll. Not gonna lie, we did spend a significant amount of time shooting the food that I thought we’d be having cold food. 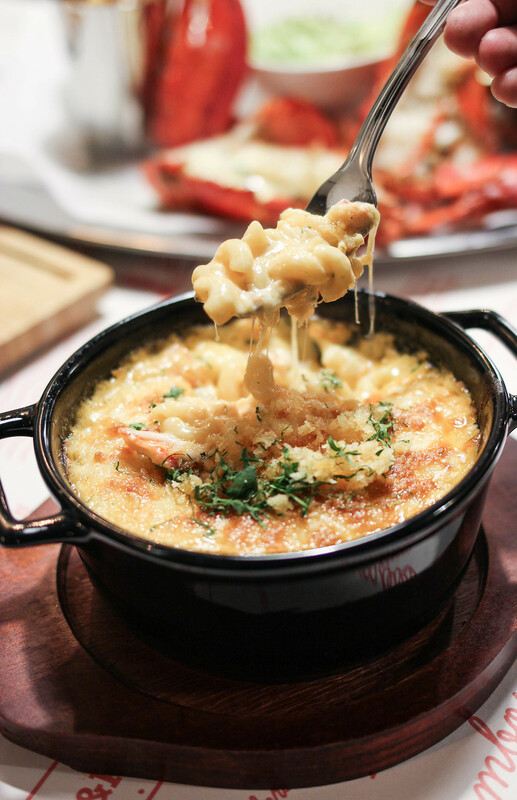 But the Lobster Mac & Cheese (SGD29) remained warm in its pan. The molten mozzarella cheese also remained gooey and stretchy, enwrapping the mixture of elbow pasta tossed with (a not too shabby amount of) chunks of lobster meat. Needless to say, we polished the bowl clean. Two new items will also be launched – what a pity that they weren’t available when I went before the grand opening. 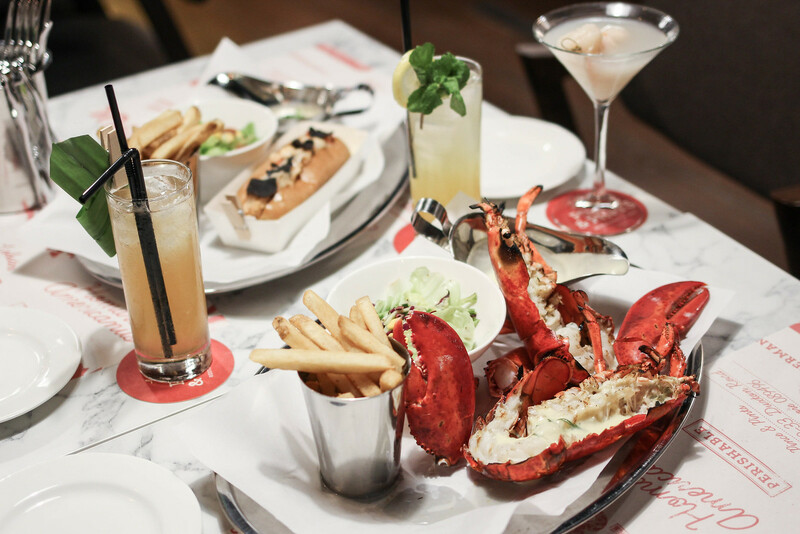 Watch out for The Lobster Burger (SGD42) which features a deep fried lobster patty seasoned and breaded with spices and The Lobster Noodles (SGD58) – think Chinese style stir fried egg noodles topped with lobster and served with sambal chili. The latter sounds like a perfect dish for families. Thanks Pince & Pints and Protegie Group for the kind invitation!